Last night the dogs were worked up; one particulary would not stop barking at 2:30 am. Dogs are respected, well-fed, believed to be the stage of life right before becoming human. Even so, recognizing there is an overpopulation, a dog sterilization program started five years ago. Early birding around Punakha in hopes of glimpsing a White-bellied Crane (similar to our Great Blue Heron). Rare and endangered, there are only 60 individuals left in the world, 39 in Bhutan. Not great odds for them or for us. HOWEVER, after a picnic breakfast along the Puna Tsang Chhu river in full sun, at 11:00 in same river, there is a White-bellied Heron, the second largest heron, displaying an incredibly long neck. We are overjoyed. The rest of the day was spent traveling south to within 60 km of the Indian border. Still in the mountains, but the temperature climbed. We were actually too hot by lunch, set up under the trees. No matter which side of the bus, the switchback roads put your seat in the sun half the time. Birding at turnouts, eventually we arrived at a private property owner's field where an encampment was set up for us. 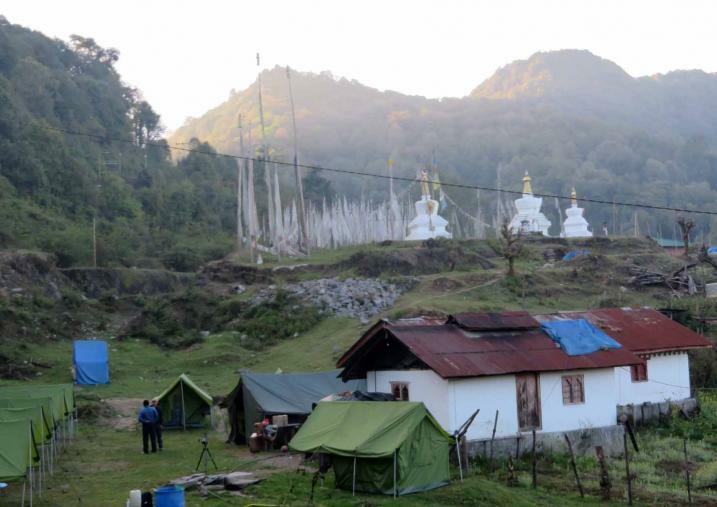 Eight double tents, a mess tent, the Pee Tent, all protected by a stand of prayer flags. This is where we spend tonight, the first of three nights we'll spend camping (not all in a row). The camping is necessary because of a scarcity of tourist hotels. Our luggage was in our tent at the foot of each of our cots when we arrived. Beds were made with a foam mattress pad, pillow, sheets, two thick comforters on top. Once in our own sleeping bag liners, we are nice and toasty (though I'd love a hot water bottle right now!). Stars are out, it's not too cold, but I hear snoring and dogs barking!